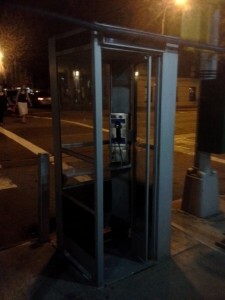 I was walking down West End Ave Last Saturday night after a gig when I saw it, on 100th street: a phone booth. I stood there and stared at it, then I took a picture of it, then I got inside and picked up the receiver. A lusty dial tone. It worked. I was excited to find this relic of a bygone time, not in the corner of a convenience store parking lot in, say, Indiana, but here, undisturbed, and only slightly (almost tenderly) defaced, on a Manhattan Street corner. It was a little jarring — slightly breathtaking, like seeing a deer or Lucy Liu. I inevitably thought of Superman changing — specifically, the version played by good old Christopher Reeve, who took my breath away in the 1978 movie and from whose era this phone booth seems to have come. Some Googling tells me that the freestanding, outdoor, 4-sided phone booth I breathlessly stumbled into is one of only 4 left in all of Manhattan. All four are on the Upper West Side’s West End Ave (there’s another on 101st that I walked past without noticing). No one seems to know why only these four remain. It’s due either to the generous caprice of a Verizon executive, the tenacity of a few preservation-minded residents, or the klout of a Hollywood executive who demands actual phone booths to lend his films veracity. Incidentally, there *was* a movie called “Phone Booth” set in Manhattan, but instead of using a real phone booth they built a fake one, on 53rd and Broadway, before deciding New York was too cold, whereupon they moved the whole production to L.A. That movie contains the immortal line “hang up the f#@*king phone,” which, in a world full of cell phones but devoid of phone booths is something we’ve all wanted to say. ok blogging every day is hard. If I could blog every day about being tired, that would be easier. cause guess what, I’m tired again. The commute. The commute from Jersey to NYC back to Jersey is not easy. As soon as I get a chance I believe I will move back to NY. In fact I honestly can’t wait to live in NYC again. Someone is giving away a stripper pole, and apparently wants it gone very badly. Album news. We finished the digital mastering today, and it’s being sent to the vinyl mastering guy tomorrow. Artwork and vinyl mastering should be done this week. I’m excited to have an actual vinyl record out. Apparently they’re making a comeback, according to this article, anyway. The company I plan to use, Brooklyn Phono (chosen for reasons of proximity and expediency), is featured. Today I woke up after a fitful night’s sleep and knew instantly that I was going to be ridiculously tired all day, the price I paid for having a miniscule amount of coffee the night before to keep me awake in a meeting. I’m constantly falling asleep in evening meetings full of 20-somethings, and in order not to be the old-guy-falling asleep at 9 o clock, I drink coffee and then I pay for it like I did today. It was a church meeting. I’m the oldest person at church, save for Stephanie. Thanks, Stephanie, for saving me from being the oldest person at church. So I was tired all day, and while I still pretty much got done what I needed to get done, I did it slowly, as if underwater, or being chased in a dream by a slow-footed but determined monster. And my heart felt like I was being chased in a dream too. Stressed out. I did later manage to muster up enough of a human feeling to tell a girl in a Piggly Wiggly shirt that I liked her shirt. And then later I told a dude with a huge silver handlebar mustache that I liked his mustache. which restored my faith in humanity in general and my own humanity specifically. 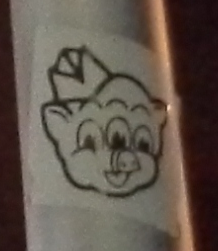 here’s a hipster Piggly Wiggly stuck to a lightpole in Brooklyn. I know you hunger for Ed Asner interviews so here’s one more.